Done in WC in moleskine. My goal with both these paintings was to keep them light and fresh by incorporating the white paper as part of the composition. 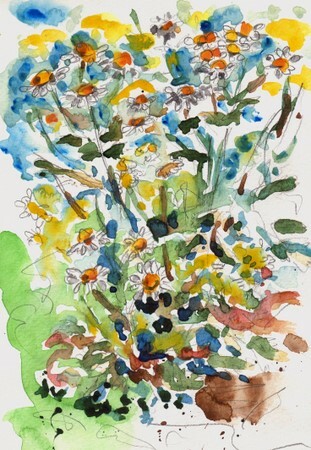 With the feverfew, I used more “dabbing” of color, since that is how I perceive them in the garden. These are gorgeous! I really love the loose, simple style and colors mixed on the paper. Wow, what abeautiful work. I just bought some books about the work of Charles Reid. This paintings, especialy the first one, reminds me of the book. Great work. Oh my, these are lovely! I really like the fresh, spontaneous feel of these paintings. The feverfew are gorgeous. Definitly spontaneous, definitly loose and defintly WONDERFUL!!! My favorite is the first one though both a lovely, loose, and colorful. Superb. The colours are lovely! Ronnell — fresh, lively, colorful, glorious — all of this and more!! Your daylily is absolutely breathtaking!! I AM IN LOVE with the various hues within it — and I too grow feverfew — but never again — I find it takes over too MUCH of the garden! GRAND JOB!!!!!! oooh! I love these drawings…. I have lilies and feverfew also. I’ve got big bouquets all over the house. Question: how do you USE the feverfew for a migraine? make a tea and drink it? sniff the leaves? I’m interested in knowing…Thanks! Lovely – I particularly like the way that blue makes the yellow sing in the second painting – makes me think of late summer, and lazy afternoons in the shade. These are just wonderful – fresh and lively and full of color. 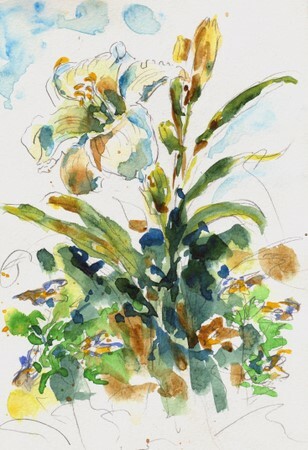 I definitely see a resemblance to the lovely, loose florals of Charles Reid, although they are your own personal style. How do you find the time to et all this done? You’ve been so productive lately. Oh my gosh!!! These are BEAUTIFUL Ronell. Beautiful dancing lines, sparkling white and a fairytale touch with the colours, Ronell. I long to paint so instinctively. Thank you for all the inpspiring comments..
Robyn – you are a poet. Ohh, these are so fresh and light! I love the techniques you used here. You must have a great garden. Both are beautiful in their own right, Ronell. I love the loose, airy feel you have achieved and the splashes of colour are divine! These last few sketches are so beau;tiful and fresh. They truley capture summer! I looked at them enlarged and they are so free flowing. So gorgeous. I would love to walk through your garden some day.wow.. Ronell, thanks for all your comments…they are appreciated… I just love coming here to see what you’ve been up to, when I’m out sweating in the dirt in my garden. haha. I keep thinking I want to go outside and paint but somehow it never works. How do you do it?? These are lovely, Africantapestry! I love your loose style and I wish I could paint as freely as you. Simply gorgeous! All those colors and shadows and details. Well done! Happy, happy, loose and lively work! I LOVE them! You’re so in your element! Lovely colours, Ronell, particularly in the feverfew. I have tried chewing the leaves for a headache, but they tasted so rotten I think I preferred the headache. These are lovely sketches. So colorful and full of summer. Lovely, cheerful and extremely fresh! So well done. The flowers are lovely, Ronell. Chrysanthemum is my favorite flower. The florist wasn’t too happy when I insisted on chrysanthemums only bouquet for my wedding. It bothered his artistic taste, I think. I remembered he used variety of chrysanthemums, and feverfew was one of them. 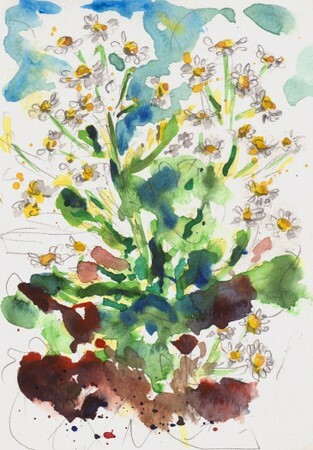 I’m happy to see the beautiful feverfew you painted.